Clindamycin-Benzoyl Peroxide is a prescription topical antibiotic. It is used to treat a wide variety of bacterial infection including the P. acnes responsible for the formation of acne. P. acnes is a common type of bacteria. It feeds on the skins natural oil produced in the sebaceous gland. The fatty acids and waste product produced by the bacteria irritate the skin causing spots and inflammation. 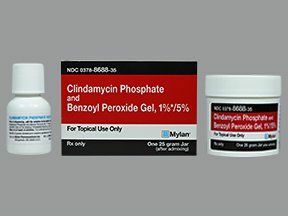 Clindamycin-Benzoyl Peroxide is a combination topical medication. Clindamycin is an antibiotic. It can prevent acne-causing bacteria from growing and reproducing. Benzoyl peroxide is keratolytic that help breaks down the keratin which forms part of the skin structure. Breaking the skin keratin helps break the whiteheads and blackheads which helps unblocks the sebaceous glands. The two medication works together by removing the excess sebum and by killing the bacteria that causes acne. Use this medication as prescribed by your dermatologist. Before using, wash your face with mild cleanser. Wait for at least 20 minutes before applying the gel. Apply a thin layer to the whole affected area. Use it twice a day or as directed by your physician. Avoid getting this medication into your eyes, mouth, nose and broken or inflamed skin. If this happens, rinse the area well with clean water. Allergic reaction with symptoms like itching, difficulty breathing and swelling of the face, tongue and throat. Stop using this medication if you have signs of an allergic reaction. Seek medical help right away. Avoid applying on irritated, broken and sunburnt skin. Decrease the amount of the gel if irritation and excessive dryness and peeling of the skin occur. Do not use this medication in an excess amount. Applying too much will only make your skin irritated. This medication can make your skin sensitive to sunlight. Avoid exposing the treated area to excess sunlight. Wear protective covering like hats. Use sunscreen cream to protect your face. People with eczema must use this medication with care. Children under 12 years of age must not use this medication. Do not use this medication with products containing erythromycin. You may likely to experience excessive dryness if you are using other topical acne treatments particularly those containing a high level of alcohol. Do not use this medication if you are already using oral Isotretinoin. Do not use products containing Tretinoin, Isotretinoin with Clindamycin-Benzoyl Peroxide.